Unless you’re truly tuned in with your canine companion, you might be missing the “tail-tell” signs that your puppy’s got stress issues. By learning to recognize the symptoms and gaining a clearer picture of the potential causes, you’ll be well on your way to helping your canine chill out on a regular basis. If that weren’t enough to perk up your ears, Dr. V also drops some helpful tips for alleviating dog stress. Definitely worthy of further investigation! 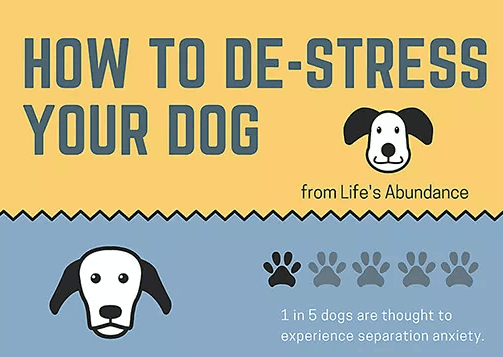 Take a page out of our pet-care book and save this handy infographic for future reference … it might just help your dog find his way back to bliss! The perfect complement to any springtime table setting, it just doesn’t get any better than this sweet treat! Not only does it double as festive décor, it's also loaded with nutrition. Packed with protein from egg whites, a super-health boost from Life's Abundance Minerals & Antioxidants and minimal sugar, the crowd will come running for more. This simple recipe yields about 45 cookies. Place the oven rack in the top 1/3 of the oven and preheat to 350 (see overnight method) or 225 degrees (see alternate method). Line a baking sheet with parchment paper. Using a stand mixer or hand mixer, beat egg whites on medium-high speed until soft peaks form (about 15 minutes). Slowly add sugar one tablespoon at a time and keep beating until stiff peaks form. Once all of the sugar has been incorporated, sprinkle Minerals & Antioxidants one scoop at a time and beat for another 2-3 minutes. Spoon small dollops (about 1-inch round) onto the parchment paper. Or, you can pipe the batter onto the parchment using a pastry bag and 3/4-inch tip. Dust each cookie with a sprinkling of lime zest. Overnight Method (325 degrees): Once the cookies are in the oven close the door and turn the oven off. Do not open the door until morning. Alternate Method (225 degrees): Bake the cookies for 35 minutes and then turn the oven off, allowing the cookies to continue drying as the oven cools. Store in an airtight container at room temperature for up to five days. Enjoy! 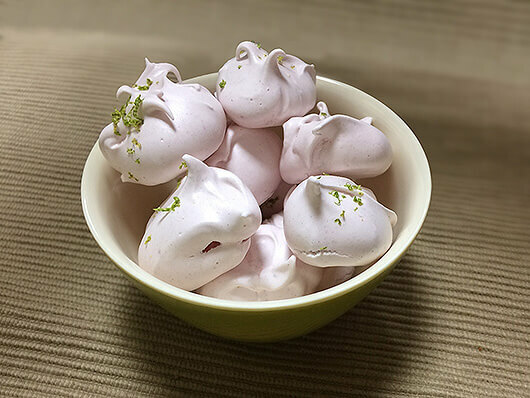 The perfect complement to any springtime table setting, it just doesn’t get any better than this sweet treat that doubles as festive décor and is loaded with nutrition! Is a Paleo Diet Right for Your Dog? As pet parents ourselves, all of us here at Life’s Abundance know just how overwhelming it can be to choose the right food for your dog. There is so much conflicting information out there: you have to be grain free! Your canine needs to eat like a wolf! You should be putting antioxidants on everything! Home made food is better than commercial! How do you possibly make sense of all the conflicting information from so many different sources? One of my goals when formulating a new food is to keep up with the most current thinking in nutrition while making sure our foods live up to the highest standards possible. Two of the most popular buzzwords right now are “paleo” and “limited ingredient.” But what do these mean? Are paleo or limited ingredient diets what your companion animal really needs? Let’s take a look at the evidence. Paleo diets have been all the rage in human nutrition for the past few years. While there isn’t any one strict definition, the general idea is that if a caveman didn’t eat it, neither should you (or in this case, your dog). In its most basic sense, the paleo diet avoids all processed foods such as cereals, pastas, and added sugars. The paleo diet also frowns on grains, keeping carbohydrate sources limited to those occurring naturally in vegetables and fruits. Despite the fact there is no one true ‘paleo’ definition, we can certainly look at the overall concept and see something to like. A paleo diet is nutrient-dense, with every ingredient chosen for a purpose. The carbohydrates chosen are those that cause less peaks and valleys in blood glucose and energy levels throughout the course of the day. Given its reliance on unprocessed ingredients, a paleo food is going to avoid things like fillers and artificial colorings and flavorings. One of the major drawbacks to a classic paleo diet is the fact that it does not allow the use of legumes such as peas or lentils, which are an excellent source of protein, fiber, vitamins and minerals. Limited ingredient diets came about due to a wave of pet parents being concerned their dogs had food allergies. The number of dogs who actually have food allergies is not as large as the number of dogs who have food allergy symptoms (there are complex reasons for this, which perhaps I’ll cover in a future post). Regardless, the idea for limited ingredient diets is to limit intake to novel proteins (meaning an unusual source that a pet has not eaten before), and novel carbohydrates, the diet is less likely to trigger a dog’s food allergy symptoms. This is how we ended up with diets like kangaroo and oats, or duck and peas. The most common food allergens in dogs are beef, chicken, lamb, wheat, corn, and egg. This correlates to the most commonly used ingredients in pet foods, which makes sense. If your canine has a true food allergy, he or she is probably going to need to undergo an elimination trial and all sorts of testing to see what is going on, and then move onto a special diet for the rest of his or her life. 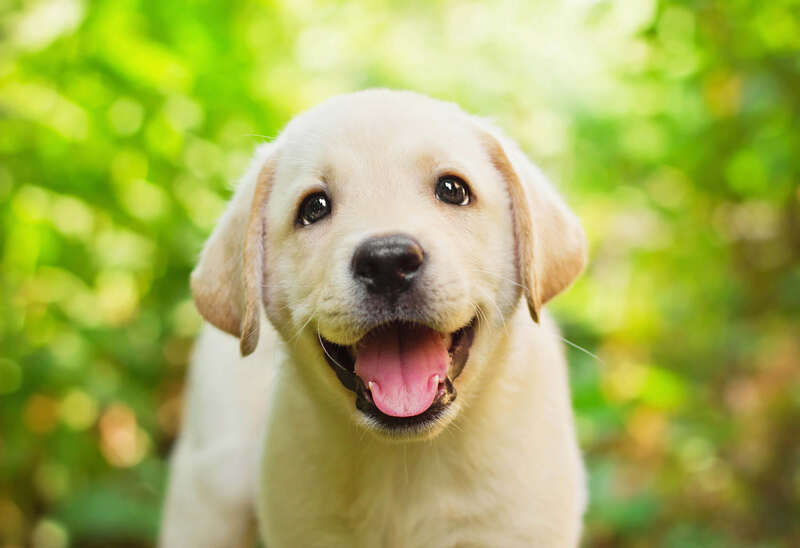 But if he or she has some minor symptoms of food intolerance or if you are just trying to avoid the major allergens in dog foods, it can be cost prohibitive to put your pet on a novel protein diet; many are prescription-only or are not meant for all life stages. Some diets are based on hydrolyzed soy, which is as appetizing to dogs as it sounds! It just doesn’t make sense to seek out one of these diets if you don’t have to due to medical necessity. For many pet parents, their dog may not have food allergies but they still want to avoid the common triggers by feeding high quality, novel proteins that taste delicious and support optimal health. And it’s with these needs in mind that we developed the newest addition to the Life’s Abundance family of foods: our Pork and Venison Grain Free Recipe Dog Food. This formulation holds to the paleo ideas of being grain-free. The carbohydrate sources are peas and lentils, which are an excellent source of protein, fiber, vitamins and minerals. The protein sources are pork and venison, which are very rich, nutrient-dense protein sources that taste amazing. Canned foods are great for triggering the appetite because they have more potent smell. Trust me, we’ve all taken a whiff of the new formula and agree … the aroma is pretty yummy! 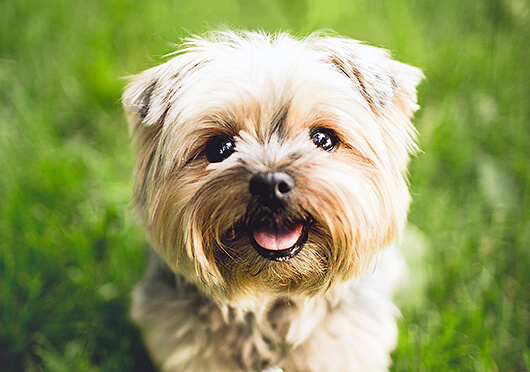 Best of all, it’s formulated to be appropriate for all life stages, from weaning puppies to geriatric seniors, even if they’re missing some teeth. We are so proud of this new formula and we can’t wait for you all to try it. As soon as you do, post a comment here and let us know what you think. We hope your dogs love it as much as ours do! Thank you for all you do to make the world a better place for companion animals! And, happy feeding! As pet parents ourselves, we know just how overwhelming it can be to choose the right food for your dog. There is so much conflicting information out there! Don’t take this the wrong way, but chances are that you’re deficient … in minerals. That’s because nearly half of the U.S. population receives less than the daily recommended levels of one or more minerals. Despite awareness campaigns to highlight the critical role minerals play in optimal body function, confusion persists about how to avoid a mineral deficiency and know if you’re affected. Inadequate mineral intake has become problematic because our food supply simply does not provide the same amounts or variety of minerals that diets did 100 years ago. This is largely because our food is grown in increasingly de-mineralized soils. Plus, the more that we rely on processed food (even if it’s fortified), the fewer minerals we ultimately consume. Other factors affecting mineral levels include pregnancy, dehydration-causing illnesses like those involving vomiting or diarrhea, and more serious medical conditions such as kidney disease. Certain medications and alcohol consumption are also common causes of reduced mineral absorption. For these reasons, in the U.S. nearly a quarter of all of dietary supplements are purchased based on a physician’s recommendation. 1. Low energy or fatigue: If you’ve been waking up tired, relying on an extra cup of coffee, or generally wondering where the pep in your step has gone, it may be a sign that you are low in magnesium, calcium, iron, potassium, zinc, sodium, selenium, copper or chromium. 2. Aches and pains: If your limbs feel a bit wobbly after walking a flight of stairs, you are experiencing leg cramps or have unexplained joint or bone pain, you may have low levels of magnesium, calcium, potassium, sodium or manganese. 3. Emotional or cognitive symptoms: Inadequate magnesium, iron, potassium, sodium, zinc or chromium contribute to irritability, confusion, brain fog, mood swings and even anxiety. Be aware that women’s mineral stores are regularly depleted. Experimenting with supplementation during ovulation can be a means to help with menstrual symptoms of an upcoming cycle. 4. Tummy trouble: We commonly associate bloating, gas, nausea, stomach cramps and diarrhea with food sensitivity, but low levels of potassium, sodium, zinc and magnesium can also lead to these same gastric issues. 5. Visible changes in your appearance: Calcium, iron, sulfur, zinc and copper all support the integumentary system which is the protective grouping that involves hair, skin and nails. The development of brittle, course or thinning hair, pale skin or brittle, yellow or spotted nails can all point to a long-running deficiency in one or more of these minerals. For precise information and advice on your mineral levels, talk to your doctor about adding these tests as part of your annual physical. If the results indicate a deficiency, be aware that even with supplementation and diet improvements, it may take up to a year to fully reverse depletions such that a blood test can confirm. That being said, your efforts will surely be rewarded! To add a steady source of minerals to your diet without investing in half a dozen costly supplements, look for one product that provides a wide array of these life-sustaining substances. Life’s Abundance Minerals & Antioxidants drink mix fits that bill, containing 74 trace minerals including calcium and magnesium that have been sustainably sourced from sea vegetables. Plus, this product features a wealth of antioxidants from 11 super fruits and alkalizing, electrolyte-rich organic coconut water. This formula features aloe vera powder which provides a source of digestive enzymes to help maximize the product’s benefit. Plus, it’s absolutely delicious, which makes Minerals & Antioxidants a dream solution to give the entire family what they’ve been missing. Don’t take this the wrong way, but chances are that you’re deficient … in minerals. That’s because nearly half of the U.S. population receives less than the daily recommended levels of one or more minerals.